Standard - $1,219.99 X-Large - $1,219.99 ¡Solo quedan 6! 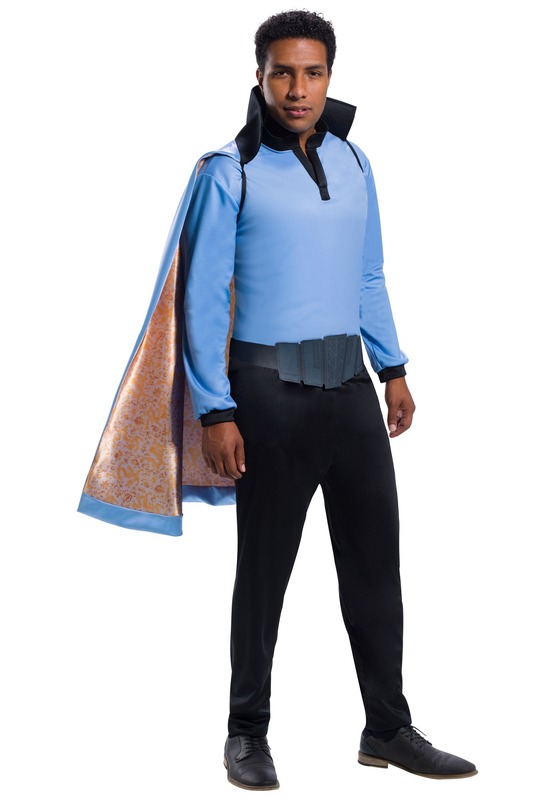 Suave, sophisticated, and undeniably cunning, Lando Calrissian is our vote for supreme ruler of the galaxy. He may not wield a lightsaber or wear an unconventional mask to impede his breathing, but he's as sharp as a tack and given the chance we'd follow him from planet to planet scamming unsuspecting alien-folk, because it's a lot better than searching for scrap metal or joining Stormtrooper camp (yes, it's a thing.) Sure, Lando's not the most trustworthy individual since he cheats in nearly every game of sabacc he plays but he does it with such finesse, we feel tempted to follow him blindly through the solar system's blackness. A long as we bribe him with some major coin, there isn't a harrowing situation Lando can't save us from. Sorry Solo, our allegiance lies with Lando. If you want to be Lando Calrissian, the charming outer space smuggler from Solo: A Star Wars Story then this costume will spark your transformation into the most infamous galactic gangster. It's also a surefire way to become 'that guy who's effortlessly cool' at any costume party casually penciled into your calendar. You'll have the entire solar system nestled in the palm of your hand once you're wearing this officially licensed 4-piece Star Wars costume. The blue long sleeve shirt has black sleeve cuffs to match the sleek collar. The cape, featuring shiny, ornate, and decorative interior fabric, attaches around the shoulders with stretchy straps. The elastic waistband pants are black and accented by the included belt which uses Velcro to attach around the waist. Form an elite crew of coaxium chasers by making this costume part of a Star Wars themed BFF costume. Get Han Solo and Chewbacca to accompany you on a mission this Halloween and it's bound to be a wild ride!